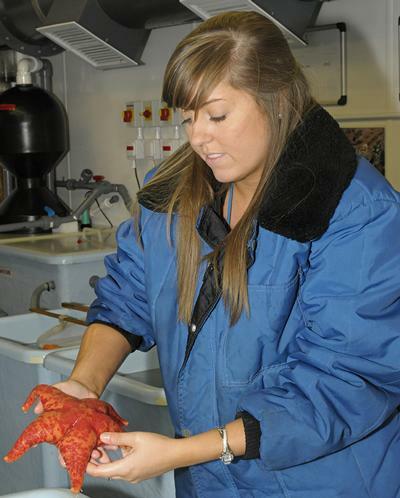 Emma studied MSc Marine Biology within Ocean and Earth Science, National Oceanography Centre Southampton at the University of Southampton. Antarctic Studies was my chosen final year dissertation topic, which gave me grounding in Antarctic science and helped me get my current job. What was your degree when you studied at Southampton and when did you graduate? Best University in the UK for Marine Biology and third best in Europe. I liked Southampton City. Where do you work and what is your job role? Marine Ecologist with British Antarctic survey. I started a PHD with the British Antarctic Survey and University of Cambridge in October 2012. What aspects of your degree do you use in your day-to-day job? I study penguins, researching their life history and environment requirements, which will then be used to form a model to determine how their distribution is being effected by climate change. On a daily basis I undertake a great deal of literature research looking at other people’s data, communicate with other scientists in the building who specialise in penguin species and also examine their unpublished data. My final year dissertation topic was Antarctic studies, which gave me baseline knowledge in Antarctic science. The big projects I undertook as part of my degree have also given me confidence in literature research. Did you enjoy your time at Southampton - what memories stand out from your time here? I thoroughly miss University. An academic highlight was my work in the lab for my dissertation and also the opportunities we were given to use the University's brilliant facilities, including the RV Callista research vessel. I also have many happy social memories, as right from Fresher’s week Southampton makes you feel welcome and encourages you to get involved and meet lots of great people. How did the University help you prepare for employment? The University has a good careers service, especially at NOC. The alumni days - when past students came in to present about their jobs - were very inspiring and opened my eyes to new opportunities. What advice would you give to current students in order to help them get one step ahead of the competition? Experience is everything. Choose a dissertation topic in an area you think you might go into as it gives you specialist knowledge when it comes to applying for a job.